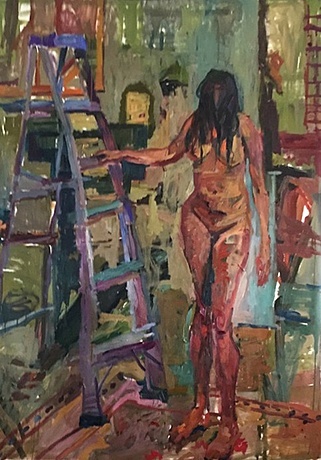 Aissa's Ladder, Oil on canvas , 60" x 40"
Growing up in Los Angeles I try to make paintings / drawings that reflect the light and texture of the world within the city. I focus primarily on painting and drawing direct from life whenever possible.as the space and forms build the composition of the work. Much of the emotional content is a byproduct of this method of working, a result of the mechanics of seeing I employ in the process of making the work.